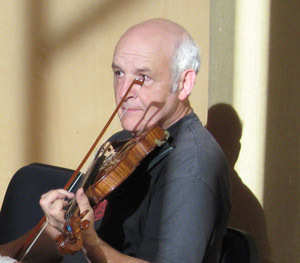 Randal Bays is an American musician who's been playing Irish fiddle for more than thirty years. He's now widely recognized as a master of that complex and ancient art, in particular the fiddle styles of rural western Ireland. Critics have said some pretty nice things about his playing... he's "among the best Irish style fiddlers of his generation", according to Fiddler Magazine. It's unusual for someone not born in Ireland to get that kind of acclaim. So what's kept him going all these years? “In Irish music there's a sort of built-in bias against commercialism, and the only thing that really matters is that you have the respect of the good players and the people who love and follow the music.” Judging from the people he's worked with he must be a pretty good fiddler. They include James Keane, James Kelly, Gearoid O'hAllmhurain, Roger Landes, Martin Hayes, Tom Creegan, John Williams, Daithi Sproule, and the late Michéal O'Domhnaill. In the early 90s, finding that none of the big record labels were interested in the music of an American playing Irish music, Randal formed his own label, Foxglove Records, which was one of the first independent labels that came into existence with the dawn of the internet age. On Foxglove he released a string of well received CDs, some of which became classics of the genre, such as “The Salmon's Leap” (1999), recorded in the back room of his house in Seattle. Besides his touring and recording successes, including concerts and festival in the U.S., Europe and Canada, Randal is a highly respected as a teacher of Irish fiddle. Some of his students have gone on to become performers and teachers themselves, helping to extend and deepen the tradition of Irish fiddle music in North America. Bays co-founded and directed the Friday Harbor Irish Music Week for ten years, and is currently the Program Director of the Cascadia Irish Music Week on Whidbey Island, off the coast of Washington state. He's taught at most of the important Irish music camps in the U.S. and Canada. Randal lives in Seattle with his musical family, where he teaches private lessons and classes and leads one hell of a good session on Sunday afternoons. Read my music blog here.